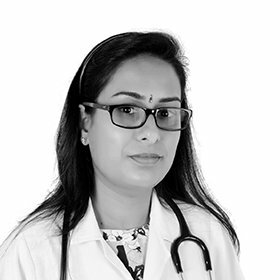 Dr. Nisha Raj has more than 12 years of experience in the field of Paediatrics. She worked as a Consultant Paediatrician in various Multispecialty Hospitals in Kerala from 2006 to 2012. She took her MBBS studies from Kottayam Medical College in 2001 followed by DCH in 2005 which she took from Calicut Medical College. Her Observership studies were held at Children’s Hospital of Philadelphia and at Pinaccle Health Hospital, Harrisburg both in USA. Afterwards, in 2018, she obtained MCRCPCH from Royal College of Paediatrics and Child Health from London, UK. She is a member of various Associations such as Royal College of Paediatrics and Child Health, London, UK, Indian Association of Paediatrics, Indian Medical Association, and a Registered Medical Practitioner in Travancore Cochin Medical Council.